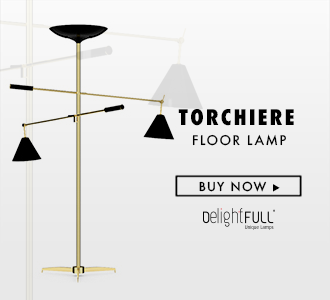 ICFF 2016 is taking place at New York City’s Jacob K. Javits Convention Center, May 14-17, 2016 and it promises to bring the best lighting designs as well as modern furniture. The 28th annual ICFF, North America’s platform for global design, will unveil the latest trends of the premier showcase for contemporary design. North America’s premier show, the ICFF provides a packed schedule of exhibits and features, as well as a series of fascinating, fun, edifying programs. Javits Center will be abuzz with more than 33,000 interior designers, architects, retailers, representatives, distributors, facility managers, developers, manufacturers, store designers, and visual merchandisers. Over 700 exhibitors from 30 countries will come together at New York’s Jacob K. Javits Convention Center to present the best in high-end design and architecture at ICFF 2016. From inventive lighting to shimmering new wallcoverings, these are some of our favorite new products at this year’s show. The pieces pay homage to Robert Long Lighting’s 54-year legacy of post-war Californian lighting design coupled with a modern sensibility and aesthetic. Designed and manufactured by a team hand-selected craftsmen in Sausalito, CA, Robert Long Lighting’s creations honor the beauty of simple and honest forms. The Fresnel Pendant is inspired by French physicist and engineer Augustin-Jean Fresnel (pronounced fra-nell) who is credited for the development of the multi-part lens for use in lighthouses. The distinctive lens has a ‘stepped’ appearance, which gives the light a characteristic soft beam. This eye-catching piece combines an industrial structure with sophisticated modern accents. The intersecting metal legs almost seem to play tricks on the eyes and change shape as you circle around the table. In the classic finishes of innermost best-seller – Beads, this is one small Boule with a great impact! Boule is a part of innermost’s Essentials Collection. Walnut, cherry, ash, white and greyed oak, mahogany, and other hardwoods are available for each unique made to order piece. The table tops also can be fabricated in clear or translucent glass. This series of console tables combines hardwoods and steel. The steel bases are finished with a patina that has depth, warmth, beauty, high resistance to abrasion, and extreme durability. Ideal for a classic living room with a modern touch, Matheny stilnovo suspension lamp came to reinvent classic designs with a high aesthetic feeling. Its shape or dimension can assume a round, oval, square or rectangular format to suit just perfectly your dining table or living room. Composed by geometric golden tubes, it reflects the sophistication of a timeless iconic piece. This remarkable throng of exhibitors creates an unparalleled opportunity to view a broad yet highly focused selection of the world’s finest, most innovative, and original avant-garde home and contract products side-by-side, under one roof.